Alright, great to see that it's going to be up again! If anything, I'd also suggest what has already been mentioned (probably CKFS: viewtopic.php?t=84). One would need to get contacted with Grafix if a new account is desired, or so it seems. OK, it's been sent to Fleexy to download & host. Thanks. I resent the link and it didn't bounce, did you get it? Better be quick or it too will expire. Link received, data uploaded. Will be available at 4:30 PM CST. 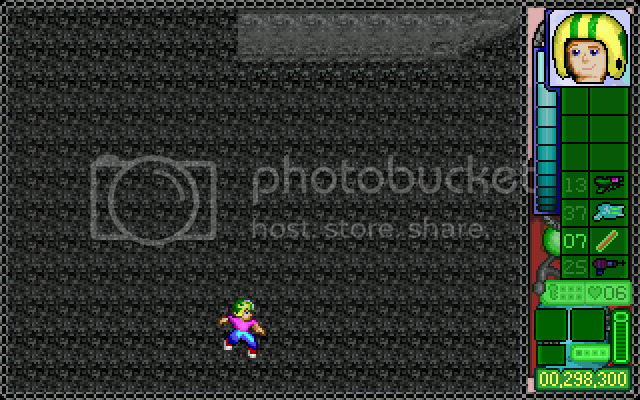 I will give you an unauthorized copy of Keen 10: Celick Makes Another Commander Keen Game, if you can guess my real name! Level 3 is really getting on my nerves. On every attempt, I seem to inevitably do something stupid that gets me killed or–on my now last attempt for a while–stuck. After many attempts, I got past the the green key door, entered the hole in the wall, and then accidentally ran into an evil pool with spikes. Ouch. Now I just made it past that door and hole again and decided to seek a way to grab the 1up item above; I grabbed onto the roof corner to the left of the hole exit, and then fell through the wall and got stuck beneath the floor unable to jump or pogo my way out (screenshot). It's nice to see what has been done, at least up to level 3. In comparison to original Keens, the levels do feel big. The fact that you can't save in-level anywhere may also contribute to this (as I'm used to saving in-level, within Keen 4-6... *giggles*). Restarting the level doesn't solve that, even if you go to the main menu and only then reload. Restarting the app, as expected, solves this. - In the room where you get the yellow key, mostly above the door, there seem to be tiles which harm Keen (decreasing health), even though I don't see anything like spikes. - A bit similar to Shadow Master's recent report: After going through the green key door and then the "warp" door, I've had an attempt at obtaining the Chocolate Yorp. I've grabbed some "ledge" in the ceiling (basically a glitch), eventually getting stuck above it. I could go up and right for some time while getting to nowhere; On the left (and bottom), I could get right near the yorp, but not actually obtain it. Basically, I could stand to the right of the yorp. I do realize it is expected, though, and what we've got is clearly better than having no Isis II release at all.